Looking For My Feet: Healthy Cooking Giveaway with CSN Stores! Healthy Cooking Giveaway with CSN Stores! Blenders. Slow cookers. Utensils. Food Processors. Dutch Ovens. Saucepans. What do all of those things have in common? 1) They're all things that you can use to make delicious, HEALTHY meals to help with your weightloss. I have run a couple of giveaways over on my other blog, courtesy of CSN, and they were well received. So, when I was approached to do one here, I jumped at it. I would have loved to have done a review of one of their products but, alas, I live in the wrong part of the world. So all of you lovelies out there get to benefit instead! These beauties come in Cherry Red, Caribbean Blue and Kiwi Green. There's a 9" baking dish and a 5" one with it. They're beautiful and wonderful and I think everyone should have a set. So how can you win these? Just leave a comment on this post. You can comment ONCE a day until the end of the giveaway. At the end, I will draw using the Random Number Generator. Competition is open to all US and Canadian residents. Please make sure you have a valid email address. If I can't get hold of you, I'll give it away to someone else. Giveaway closes Friday 1st October, 2010. Oh...and I fully expect a yummy recipe from whoever wins! Well, someone has to start! I'll go first, and be back again tomorrow! Terrific! I would love to be counted in!! Hey sweets! I'm glad to see more posts, and ESPECIALLY about giveaways! 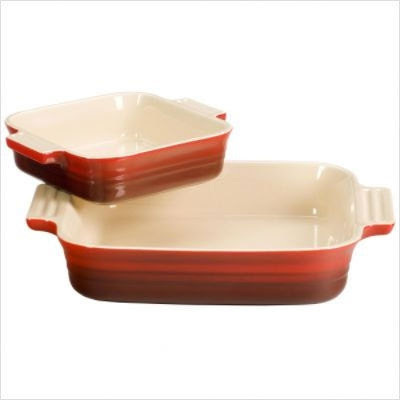 I covet Le Creuset so hard! I'm in love with those pans!! Please put my name in the hat! kj dot white at gmail dot com! I love cooking with cast iron. I've always thought Le Creuset was so beautiful. I don't have a single piece of Le Creuset, but I stare at it when I get to see it. There's something so beautiful about it. Yay! They're so pretty. Love both of your blogs - they bring smiles to my face. Thanks for the chance. it is a great giveaway. This is an amazing giveaway and I love that I found it! Good luck with your journey as well! You can do it! Thank you for hosting. I'd love to be in. i woke up thinking about these guys this morning! Wow! The 1st is almost here! Come over to enter my giveaways. Today is the last day for a $10 Target GC and some Great Skincare products by Grateful Body! I love Le Creuset cookware. These pans would look great on my Thanksgiving table! I would love to have a piece of Le Creuset. Oops, guess I only get one entry! Thanks for the giveaway!